Another end of year list. This one covers all the academic papers and books I've had published in the past 12 months. I provide links to open access versions whenever possible. Clicking on the title will usually take you to such a version. I'm not sure why I continue to do this list. It seems terribly self-congratulatory, and now more than ever I appreciate that academia is not about the number of publications you have. Still, here it is. Danaher, J. 'Building a Postwork Utopia: Technological Unemployment, Life Extension and the Future of Human Flourishing' in LaGrandeur and Hughes (eds) Surviving the Machine Age (Palgrave MacMillan). I had some other book chapters accepted for publication but they aren't due out until next year. These are all the articles that have actually been accepted and published in 2017. I have some others that have been accepted but not yet published. I'm going to keep the end of year navel gazing to a minimum this year. Here are the 'top' ten substantive blog posts that I wrote this year, according to page views. The first one is actually the second most-viewed post on this blog of all time, largely due to the fact that it briefly made the front page of Reddit. Debt-financing is increasingly common. It used to be the case that people would occasionally need loans during the course of their lives, perhaps to buy a car or a house. These were exceptional cases, outside the normal conditions of life. In most instances, people would rely on savings to cover their consumer costs, or go without. This has now all changed. There is more complexity in the markets for private debt. People use loans to cover holidays, education, healthcare and other unforeseen costs. They have high interest credit cards and payday loans to help them get to the end of the month. Is this a good thing? 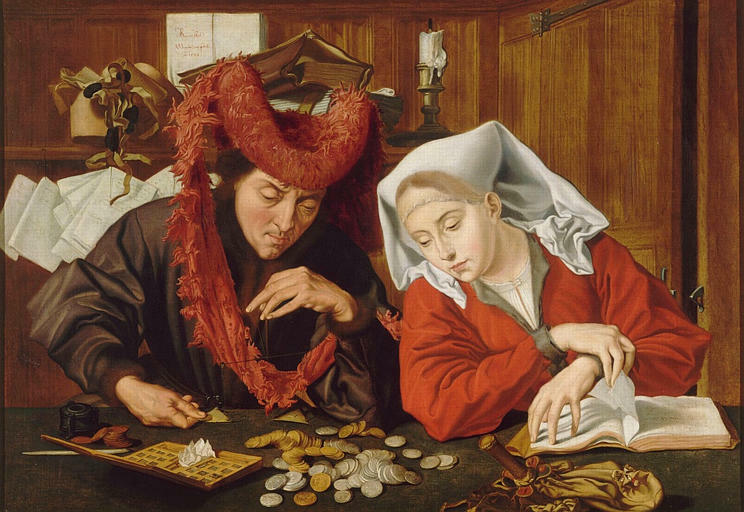 Debt-financing has a long and chequered past. For large swathes of European history, the lending of money for profit (usury) was illegal and morally condemned. There was, of course, a degree of hypocrisy about this, with usury often being tolerated in the shadows. More recently, debt has been viewed as a necessary and useful tool for a consumerist society. Economists often see debt contracts in a win-win light. They transfer money from people who don’t need it to people who do, allowing both to gain something valuable in the process. They enable people to ‘smooth out’ their consumption of goods and services over the course of their lifetimes by bringing forward in time some expenditure. They grease the wheels of economy and prevent it from slowing down too much during times of perceived crisis. But there is undoubtedly something disquieting about the explosion of debt-financing, particularly the forms of debt financing that target the poor and less well off. The financial crisis of 2008 was precipitated by a crisis in the sub-prime mortgage market, i.e. in the market for home loans to those who were perceived as being at high risk of default. Banks profited off the backs of the poor through labyrinthine securitisation and repackaging of debt agreements. While some banks suffered in the aftermath, many grew larger and fatter as governments poured debt of their own into their rescues. It is the poor and less well off that seem to have suffered the most with increased income and wealth inequality, and rocketing property prices. In her article ‘What could be wrong with a mortgage?’, Lisa Herzog tries to explain exactly why we should be disturbed by the market for private debt. Although she acknowledges the economist’s argument in favour of debt contracts — and thus thinks there is nothing intrinsically wrong with debt — she argues that there are specific features of the current market for private debt that make it ‘structurally unjust’. In short, she argues that debt has become more necessary and more difficult to handle for those from poor and less advantaged backgrounds. This exacerbates their already precarious and difficult position. This is not due to any conspiracy or fraud that is perpetrated against the poor (though that may be a feature in particular cases) but rather due to a confluence of factors beyond any one individual’s control. Herzog’s argument breaks down into three sub-arguments which compound into the case for structural injustice. The overarching structure of the argument is illustrated below. I want to examine each element of it over the remainder of this post. One condition on the justice of debt contract (and, indeed, any contract) is that the borrower enters into it following a fully informed consent to its terms. This is a challenge because there is significant inequality of bargaining power in most debt contracts. Unless you are wealthy, banks and other financial institutions will be able to control the terms and conditions of your debt agreement with little interference. 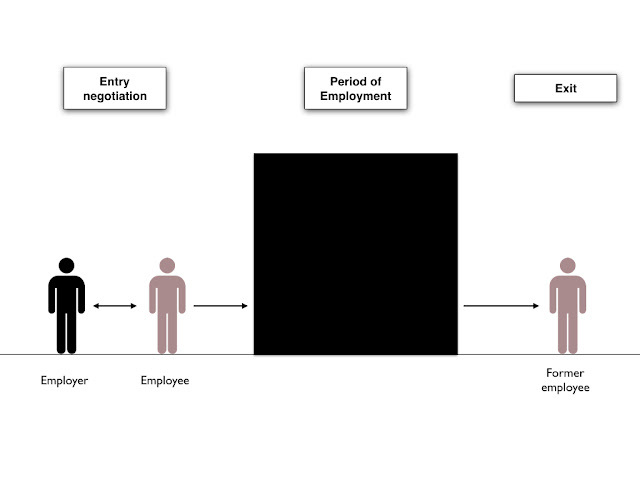 This means that when you are signing up to the contract you are signing up to their preferred model of the agreement. This is already an inauspicious starting point, but if it is to be in anyway legitimate you must know what it is you are signing up to. In other words, you must understand what your future liabilities under the debt contract are going to be: how much are you obligated to repay and over what time period? What are the consequences for you if you do not meet your repayments? If you lack this information, or are unable to understand it if you receive it, then there is the potential for injustice. Herzog’s claim is that this is more likely to be true in the case of poor debtors than in the case of wealthier debtors. This places the poor debtors at a disadvantage. 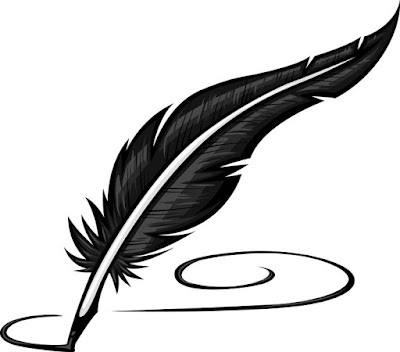 (1) In order to be just, a debt contract must be entered into on the basis of informed consent, i.e. the borrower must know and understand the terms and conditions of the agreement. (2) Poor debtors are less likely to know and understand the terms and conditions of a debt agreement. (3) Therefore, debt contracts are more likely to be unjust in the case of poor debtors. Studies confirm, for example, that subprime borrowers were far less knowledgeable about types of mortgages and interest rates than prime borrowers… Studies LINK indicate that financial literacy is distributed according to clear socio-economic patterns: it is higher for men than for women, and positively correlated to education scores. As Lusardi and Mitchell emphasize, summarizing the empirical evidence: “Financial savvy varies by income and employment type, with lower-paid individuals doing less well and employees and the self-employed doing better than the unemployed”. This lack of financial literacy means that poor debtors tend to enter into debt contracts with less favourable terms and conditions and higher costs. Think, for example, of the 2-28 mortgages that many sub-prime borrowers agreed to in the lead-up to the 2008 crisis. These mortgages charged very low, teaser interest rates for the first two years before a much higher interest rate kicked in. This often meant that unless the borrower could sell their house at a higher price within two years, the mortgages would be untenable. It’s clear that some people entered into these agreements without fully appreciating their ramifications. There are debt contracts and then there are debt contracts. If you are from a middle-class or upper-class background, you probably have a particular conception of what a debt contract is and how you go about securing one. It usually means going to a bank or building society and seeking a loan to pay for a house or a car (or some other large expenditure item). In other words, it entails going to a (hopefully) well-managed and well-regulated financial institution that will offer you reasonably favourable terms of credit (relatively low interest rates, with repayments to take place over a reasonable timeframe). The financial institution will not treat you with suspicion or derision; they will try to meet your needs on the best terms. If you run your own business or are involved in commercial financing, you may be familiar with other forms of credit, but again they will typically be sought from mainstream financial institutions on reasonably favourable terms. (4) In order to be just, the market for credit should be equally accessible to all, i.e. everyone should, in principle, have access to the same types of credit. 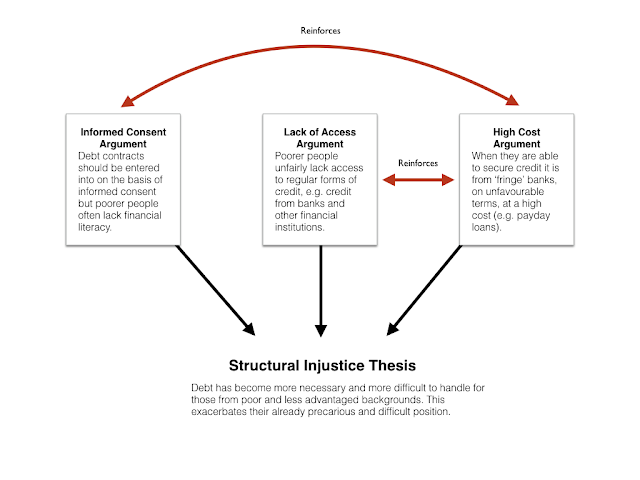 (5) Those from poor backgrounds are likely to be shut out or denied access to certain forms of credit. (6) Therefore, the market for credit is not just. Expressing the argument in these terms highlights a problem. Surely banks and other financial institutions are justified in denying some people access to credit? Wasn’t the financial crisis of 2008 caused by the over-extension of credit to people who were unable to meet the repayment conditions? Wouldn’t it make things much worse, for everyone, if everyone had equal access to credit? For example, scoring technologies often draw on data such as postcodes, which means that applicants from poorer areas are automatically rated as “riskier” than others. Individuals are thus evaluated not on the basis of what they have done or want to do, but rather on the basis of where they come from, without any attention to their specific situation. Scoring algorithms can thus be seen to erect invisible barriers to credit that unfairly target certain populations. Extreme examples sometimes make headlines, such as the case of a man who allegedly paid $50,000 of interest on $2,500 of payday loans that he had to take out in order to cover medical bills for his wife and the subsequent loans he took out to pay back the first ones. If you suffer from occasional periods of illiquidity, you are more likely to require such a loan. Poor people are, for obvious reasons, more likely to suffer from such occasional periods of illiquidity. As Herzog notes, there is a double injustice in this. The standard economic argument for debt is that it enables people to smooth out their consumption over the course of their lifetime, i.e. borrow from their future incomes in order to pay for current consumption. But, of course, this comes at a cost of some sort: you have to pay slightly more in the long-term in order to benefit from the immediate use of the money. This places you at a disadvantage relative to someone who has the funds available to cover their expenditure needs. The problem is that poorer people are likely to require more of this ‘consumption smoothing’ due to their general lack of funds. Indeed, many times they will have to borrow to meet unforeseen expenses. So they are more regularly placed in a position of disadvantage relative to social peers. This is then made worse by the fact that they are charged an additional premium for their credit they do obtain. You might argue the high cost of credit is justifiable — that it accurately reflects the additional risk involved in making loans to poorer people. But Herzog doubts this. She argues that some additional cost may be justified but that the exceptionally high cost of credit that we observe in ‘fringe banking’ (e.g. payday loans) is likely to represent some exploitation of the financial illiteracy of the people seeking those loans. As she puts it, the high interest rates charged are probably not ‘an undistorted market equilibrium [but] rather an expression of market power and one-sided dependence’ (Herzog 2016, 12). The upshot of the three arguments is that poorer people are significantly disadvantaged by the current structure of our debt markets. The three arguments outlined above combine to make their position particularly bad: (i) they have less financial literacy, and so are less likely to understand what they are getting themselves into and more likely to be exploited by lenders; (ii) they are automatically shut out from the market for regular forms of credit; and (iii) because of (ii) they have to seek credit from less favourable, less salubrious corners of the market. This may well open them up to other mechanisms of injustice, such as social exclusion and stigma due to their debt problems. Herzog closes her article by considering some potential legal and regulatory responses to the structural injustice of the debt market. I’m not going to discuss these solutions in any great depth. In general, she suggests that we should reconsider how we distribute financial risk in society. At the moment, debt contracts tend to place all the responsibility on the individual borrower if things go wrong, but we should consider redesigning them so as to redistribute some of the risk onto lenders and the broader society. Individual bankruptcy rules already do this to some extent, but more could be done. Contingent debt contracts are one solution she mentions: these would include automatic rescheduling of repayments or recalculations of interest rates if certain conditions obtain (e.g. automatic rescheduling of mortgage repayments if house prices fall). This happens, already, through individual renegotiation of debt contracts, but including it as a default rule could ease the burden on poorer debtors who face a significant inequality of bargaining power relative to the financial institutions with whom they are trying to renegotiate. I’m certainly a fan of the idea of rethinking how we distribute financial risk, particularly given that we live in a world in which banks are often bailed out for their own reckless borrowing and lending. But I tend to think there is deeper issue here: our inflationary, debt-based, monetary system, given its current structure, is fuelling our need for for more and more debt. Governments pour money into banks; banks lend this money in a way that drives asset price booms (particularly in property), which in turn create a greater pressure for debt-financing by ordinary citizens. Until we do something to address those pressures, tinkering with the default rules in debt contracts is unlikely to be that helpful. Basic Income Experiments and the Case for the UBI: What can we learn? 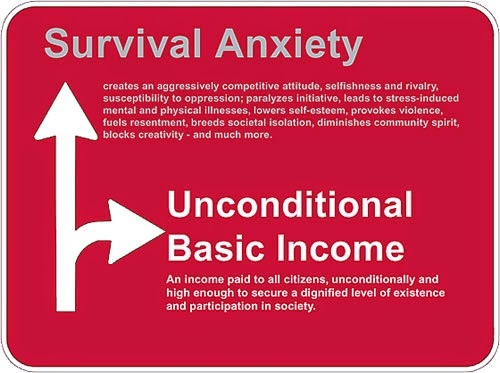 I like the idea of a universal basic income (UBI). I have written about it numerous times over the years and I think a strong political and moral case can be made in its favour. I also think a particularly strong case can be made for it at the present moment, given the ongoing structural and technological changes to the nature of work. At the same time, I think there are obvious practical and political hurdles that lie in its way. These hurdles include fears about how a UBI might incentivise boredom and apathy, disincentivise work, and be economically unsustainable due to the fact that a smaller and smaller cohort of economically active people will have subsidise those who are not. On the face of it, UBI experiments seem to provide an antidote to these fears. Around the world, several small and largescale experiments have been conducted that involve many of the features of a UBI: people are given a guaranteed minimum income without needing to prove that they are seeking work or disabled. These experiments almost invariably have positive results. Those who are paid this guaranteed income see their lives improving along several metrics of well-being, and the work-disincentive is minimal. These results have led some people to be enthusiastic cheerleaders for the idea of a UBI. Rutger Bregman, for instance, in his book Utopia for Realists expounds on these empirical results for several chapters, using them to build what seems to be a strong case for a UBI. While I share many of Bregman’s political and economic goals, I worry that the empirical case for the UBI can be overstated. My scepticism largely stems from what I understand the case for the UBI to be, and from my reading of two reviews of the empirical literature, in particular those from Karl Widerquist and Philippe Van Parijs and Yannick Vanderborght. I want to outline the case for cautious scepticism in the remainder of this post. 1. What are we arguing for? (1) If the findings from basic income experiments are to provide good evidence as to what would happen when we implement a UBI, then those experiments must have some ecological validity (i.e. the experimental world must be sufficiently similar to the UBI-world). (2) The basic income experiments tend to lack ecological validity (i.e. the experimental worlds are too dissimilar to the UBI world). (3) Therefore, the basic income experiments do not provide good evidence as to what would happen if we implemented a UBI. I’m going to take it that the first premise of this argument is relatively uncontroversial. The second premise is the one that requires support. This support can be provided in two phases. First, by explaining what the world would look like under a UBI and second, by explaining the main features of the experimental worlds set up under the basic income experiments. (b) Significant/generous in monetary size, i.e. provides enough income for someone to live on. The precise amount required might be disputable, but I would estimate something in the region of 30-50% of per capita GDP within a given state/jurisdiction. For reference this would be just under $18,000 per annum in the US and just over $20,000 in Ireland (where I currently live) on 2016 figures. The exact figure would have to take into consideration the cost of living in the particular jurisdiction. (c) Funded by taxation revenues within the state/jurisdiction in question. In other words, the money for the UBI is not provided from outside resources but from a tax on wealth and/or income (probably both) within the state. This means some people will be net beneficiaries of the scheme and some will be net contributors. (d) Offered in an economy in which work is becoming both less feasible for the majority (due to automation and inequality) and less desirable (i.e. less relevant or important for self-worth). You could challenge each of these assumptions about the UBI-world. For example you could argue that the UBI should be funded by some international system of wealth transfers (so not necessarily funded from within the state) or that the figure should be lower/higher or that it could be offered in a world in which work remains as relevant as ever. But I suspect most people would not drop all of these assumptions, and even if they did, they would have to replace them with their own. Either way, those assumptions would need to be borne in mind when critically reflecting on the ecological validity of the experiments. So much for UBI-world. To complete the assessment of premise (2) we need to consider the features of the experimental world. Obviously, there is no single ‘world’ here. There are, rather, multiple different worlds established under the auspices of multiple different experiments. Each of these worlds varies in terms of the size of the income paid to the experimental subjects, the social/cultural environment in which it was paid, the source of the payment, the conditionality of the payment, and more. I’m not going to be able to review every single basic income experiment in detail, but I will give an overview of some of the major ones for which we have data and findings (there are some other ones that are intended or in progress that I exclude from consideration). The Manitoban Mincome Experiment: This was an experiment conducted by the Canadian government in Winnipeg and Dauphin from 1975-1978. It covered 1300 families living in urban (Winnipeg) and rural (Dauphin) regions, separated into different treatment groups. The families had to earn less than C$13,000 per annum to qualify and they were paid a sum between $3,800 and $5,800, depending on their treatment group, for the years of the experiment (approximately 25% of the per capita GDP at the time). This was combined with a ‘take-back’ or ‘clawback’ rate of between 35-75% which was charged if they earned additional income through work (this clawback rate is a common feature of negative income tax and basic income proposals: the idea is that the guaranteed income is reduced (proportionally) if you earn some additional money yourself). The New Jersey-Pennsylvania NIT experiment: This was an experiment that ran from 1968-1972 in urban parts of New Jersey and Pennsylvania. It initially covered 1,216 two-parent families ‘with a male head’ from Black, white and Latino communities. Single parent families were not included. This number dwindled to 983 after drop outs. The families had to earn less than 150% of the official poverty line to be selected for the payment, and were paid between 50% and 125% of the poverty line, depending on treatment group. For guidance, the payment in the 100% version of NJ experiment in 1968 was $1,000 per annum (approximately 21% of per capita GDP). The clawback rate was between 30% and 70%. The payments were received for three years. The Iowa-North Carolina NIT experiment: This was an experiment that ran from 1970-1972 in rural parts of Iowa and North Carolina. It was intended as a rural supplement to the New-Jersey/Pennsylvania experiment. It covered 809 two-parent and female headed families. This number dwindled to 729 after drop outs. They had to earn less than 150% of the poverty rate to qualify and were paid between 50% and 100% of the poverty rate, subject to a 30-70% clawback rate. The Seattle-Denver NIT Experiment: This was an experiment that ran from 1970-1980 in parts of Seattle and Denver. It covered 4,800 Black, white and Latino families with annual incomes below $11,000 (if single-parent) or $13,000 (if two-parent). This was the most complex and longest-running of the NIT experiments. The families were paid between 75% and 148% of the official poverty rate and subject to a clawback rate of 50%-70% (though two other non-linear clawback rates were tested at 70% minus 0.025 times income and 80% minus 0.025 times income). The incomes were paid for six years initially, but experimenters got approval to continue for an additional fourteen years for some of the families. However, the experiment was cancelled in 1980 so the families only received the income for nine years. The Gary, Indiana NIT Experiment: This was an experiment that ran from 1971-1974 in Gary, Indiana. It covered 1,799 families, mostly single-parent Black families. The total number dropped to 967 by the end of the experiment. This was the highest drop out rate in any of the experiments. The families had to earn below 240% of the poverty rate to be selected and were paid either 75% or 100% of the poverty rate for three years. This was subject to a 40% or 60% clawback rate. Namibian (Otjivero) Pilot Study: This was an experiment that ran from 2008-2009 in the village of Otijvero in Namibia. Every resident in the village (approximately 1,000 people) under the age of sixty received a monthly payment of 100 Namibian dollars (approximately $8 US dollars). Those over sixty received a state pension of over 500 Namibian dollars. The payment to those under sixty represented approximately 2% of per capita GDP in Namibia at the time. The project was funded mainly by a variety of international donors, many based out of Germany. Madhya Pradesh Study: This was an experiment that was conducted in the Indian state of Madhya Pradesh from 2011 - 2012. Every adult in eight randomly selected villages was granted an unconditional income of 200-300 rupees per month (about $4-6 US dollars). This represented 6.5% of per capita GDP in that region of India at that time. Children were also entitled to half the payment received by adults. The results in the eight villages were compared with twelve other villages in which no payment was made. The project was funded by UNICEF. Give Directly Cash Transfer Evidence: Give Directly is a charity that specialises in giving large direct cash transfers to people in developing countries. Between 2011 and 2013 they ran a program in rural Kenya that was analysed by the economists Johannes Haushofer and Jeremy Shapiro. The program sent unconditional cash payments of between $404 US dollars and $1,525 US dollars to families that met a means test criterion (did they live under a thatched roof as opposed to a metal one?). The payments were given on different schedules (monthly or single lump sum) and were targeted at different members of the household, in order to study differences in response. The payments represented a considerable sum of money, over 30% of per capita GDP for the minimum payment, rising to over 130% for the maximum payment. Give Directly calculated that the payments represented more than double the average consumption expenditures of villagers in the relevant regions. The Haushofer and Shapiro study looks at 503 households who were given the payments. Miscellaneous Others: A number of other smaller scale studies have been conducted over the years and are often discussed in relation to the UBI. A popular one is the Win For Life program in Belgium. This was a program for lottery winners that allowed them to receive monthly payments for life as opposed to one single payment. There is also the Berlin MeinGrundeinkommen experiment that has funded basic incomes of $1,000 per month for over 40 people, and an experiment on 13 homeless men in London in 2009 that gave them each a personalised budget of £3,000. There are other examples too, but this suffices for present purposes. So what are the findings from all of the studies? As you might imagine, they are quite nuanced and differentiated. But, in general, the outcomes are positive. The guaranteed income payments are found to have a positive impact on individual health and well-being, and do not disincentivise work to the extent that some would predict. In fact, in some cases they increase work. Take the various North American NIT experiments (including the Manitoban mincome experiment) as an example. As described, there were several different treatment conditions across these experiments, but in most cases the payment of the income was found to correlate with positive outcomes. For example, households receiving the income typically saw an increase in educational performance and an improvement in birthweights for children born to those families (Levine et al 2004). Recipients did reduce the number of hours they worked per year. Across the five studies, the reduction ranged from 20-130 hours per year for men, and 0-166 hours per year for women. According to Widerquist (2005), most of this reduction is accounted for by workers ‘remaining nonemployed for longer if and when they became nonemployed’ and not because they reduced the number of hours they worked per week. The reduction was also highest among younger people and those with young children, suggesting that it represents an investment of time in education or child-rearing as opposed to any tendency towards apathy. The experiments also calculated how much additional tax would need to be collected as a result of the reduction in work, estimating that it would add 5-10% to the total cost. Similarly positive results are recorded from the experiments in developing countries. But in those cases all the reports suggest that the increased income correlates with an increase in economic activity, not a decrease. The Give Directly study by Haushofer and Shapiro found that the payments significantly increased (self-reported) psychological well-being and that people receiving the payments invested significantly in assets that could help them in their businesses (mainly agricultural). This led to an increase in revenue from those businesses, but not necessarily an increase in profit. The study did not find any significant increase in consumption of alcohol or drugs. The Namibian pilot project reported a number of positive outcomes, including large increases in economic activity and GDP within the village, large reductions in crime, and improvements in nutrition and well-being. This was combined with an increase in inward migration (which is something that tends to worry people contemplating basic income proposals) Some of these findings are disputed and alleged to be exaggerated but they have been defended by those involved in the program and are broadly consistent with other findings. The Madhya Pradesh studies also reported positive outcomes, with improvements in sanitation, nutrition, education and increases in labour and work. The miscellaneous other studies that I mentioned highlight similar positive outcomes. All of which suggests that the case for the UBI has some robust empirical support. But this is where we have to return to the ecological validity question. Taking the studies at face value, and assuming that all their results are accurate, is it true to say that the ‘worlds’ established by the experiments are sufficiently similar to the world envisaged by supporters of the UBI? Not really. There are important differences between the world of the UBI and the various experiments that makes it difficult to extrapolate from one to the other. One of the main problems with the experiments — and this will always be a problem until we actually trial a UBI — is that they are not truly universal. All the NIT experiments were targeted at specific population groups in specific regions, making it difficult to draw firm conclusions about what would happen if the scheme was rolled out more generally. They had a variety eligibility conditions attached to them, were paid to households as opposed to individuals, and were of limited duration. The recipients of the income knew the payments were only going to happen for a limited time and this could have altered their behaviour, making them more inclined to invest the income in education or other activities. The one exception to this might be the Seattle-Denver experiment which was supposed to last for 20 years for some recipients. Interestingly, that experiment is the one that saw the largest reduction in hours worked, with experimenters noting that it took 2.4 years for people to adjust their behaviour to the program (Widerquist 2005). In addition to this, the NIT experiments were not compulsory. People self-selected to receive the income, which could be problematic since the sample of people receiving the income might be those who were most likely to make good use of it, and we should remember that there were high drop out rates in some of the experiments. Furthermore, as Van Parijs and Vanderborght point out, all the NIT experiments excluded households that would belong to an income category that would make them a net funder of the scheme; only net beneficiaries were included. This means we have no evidence for ascertaining the behavioural effects on the net funders if we introduced a UBI. The experiments conducted in developing countries also have significant problems. It is true that in India and Namibia the incomes were given to everybody within selected villages. But the sums paid in those cases were extremely modest (less than 10% of GDP per capita) and were for a limited duration. The Give Directly cash transfers were much more generous, but they were also limited, one-time payments, given to specific sub-groups within selected regions. I believe Give Directly is changing this now and trying to provide payments to everyone within a particular locale, but I have not read any data on those schemes. Furthermore, in all of these cases the funding came from outside the jurisdictions in which the payment was received. The miscellaneous small scale experiments also suffer from a number of weaknesses that make it difficult to extrapolate from them to the world of the UBI. They tend to be unique, one-off experiments, of minimal or uncertain duration, affecting very specific or narrowly defined sub-populations. Even the best-designed experiments cannot capture the effects on the labour market which are at the core of the case for basic income versus conditional minimum-income schemes…the universality of basic income opens the possibility of saying yes to some jobs that are currently not viable and its freedom from obligation [conditions] opens the possibility of saying no to other jobs, which will therefore need to pay better or improve if they are to have incumbents. Such effects…have no chance of showing up in the experiments, partly because of their limited duration but above all because they affect only a few hundreds or thousands of individuals in labor markets of several millions. That said, the experiments discussed above do provide good evidence for something. They all suggest that guaranteed income poverty reduction schemes, that are not premised on the willingness or ability to work, and that are targeted at particular populations, can have very positive outcomes. We certainly should not stop experimenting with these schemes. But we should be cautious about using them to build a case for the UBI. There is a real sense in which implementing the UBI itself would be the first major experiment. Why is understanding more valuable than knowledge? Where ‘F’ stands for the force of an object, ‘m’ for its mass, and ‘a’ for its acceleration. So, in essence, the law is telling us that the force of an object is equal to its mass times its acceleration. I know Newton’s Second Law. If you asked me to recite it, I could. But do I understand it? Probably not. People have explained it to me before, and I’ve read various books that outline how Newton arrived at it, but if you asked me why it is true that F=ma, I wouldn’t be able to answer. This a common feature of my life. I know (in layman’s terms) what Einstein’s special and general theories of relativity state, but I don’t really understand them. I know that there are transfinite numbers, that Gregor Cantor proved this in the 1800s, but I don’t think I understand his proof. I also know more mundane things, like that Ireland’s GDP was $291 billion US dollars in 2016, and that this was an increase from $283 billion in 2015, but I don’t understand exactly how those figures are derived and why exactly they went up from one year to the next. So I have lots of knowledge, but little understanding. Is this a bad thing? Would it be better, all things considered, if in addition to knowing each of the propositions or theories described above I could actually understand them? Many philosophers think it would be. They believe that understanding is of greater value than knowledge. But what accounts for this? What is the value of understanding? Stephen Grimm’s article ‘The Value of Understanding’ outlines three major answers to that question. They divide into two camps: (i) subjectivist theories, which see the value of understanding in terms of the subjective experience of the one who understands and (ii) objectivist theories, which see the value of understanding in terms of how it connects subjective understanding to objective reality. I want to describe each of these theories in what follows. Before we get mired in the details of the particular theories it is worth briefly explaining what understanding is and what differentiates it from knowledge. Knowledge comes in different forms. You can have practical knowledge (‘know-how’) or propositional knowledge (‘know-that’). When comparing knowledge to understanding, we usually focus on propositional knowledge. This allows us to contrast knowledge and understanding in terms of their objects (i.e. what they are about). Propositional knowledge has as its object specific propositions, e.g. ‘Rome is the capital of Italy’, ‘Newton’s second law states that “F=ma”’ and so on. Understanding is different. Understanding has as its objects ‘structures’, ‘dependency-relations’ or theoretical models about how the world works. It is about seeing how propositions relate to one another and how they come to be true. It is deeper and more complex than simple propositional knowledge. You might think this provides some clue as to why understanding is more valuable than knowledge, but depth and complexity alone aren’t enough for that. One explanation of the comparative value of understanding comes from Linda Zagzebski. She provides a subjectivist account of the value of understanding that is cashed out in terms of its increased ‘conscious transparency’. The idea here is that understanding has a kind of reflexive transparency that knowledge lacks. As she puts it “it may be possible to know without knowing but it is impossible to understand without understanding that one understands” (2001, 46). Understanding thus consists of a kind of subjective ‘grasping’ or ‘seeing’ that is lacking with simple propositional knowledge. Zagzebski suggests that this puts understanding on a firmer footing than knowledge: once you understand something you are less vulnerable to sceptical doubts. Grimm points out that Zagzebski’s theory has been criticised over the years, partly on the grounds that some theoretical models that we would like to understand are not that reflexively transparent, and partly because we can often grasp things that turn out to be false. Nevertheless, Grimm thinks there is something to it, namely: there is something subjectively more satisfying about understanding vis-a-vis knowledge. It is surely more satisfying to understand why ‘F= ma’ than to simply know the proposition. Understanding helps to quench our curiosity in a way that mere knowledge cannot. It is important to realise that this subjective satisfaction need not be connected to truth. You can understand something, and derive satisfaction from that understanding, without necessarily believing that the object of your understanding is true. For example, you might understand the arguments of biblical creationists, and derive some satisfaction from that understanding, without accepting the truth of the theory. This disconnection between subjective satisfaction and truth highlights a potential flaw in the idea that subjective satisfaction accounts for the value of understanding. After all, why should your subjective satisfaction be the arbiter of value? Surely we want some connection between understanding and truth? That’s what the second theory tries to provide. It argues that the value of understanding lies in the connection it establishes between your mind and the world around it. 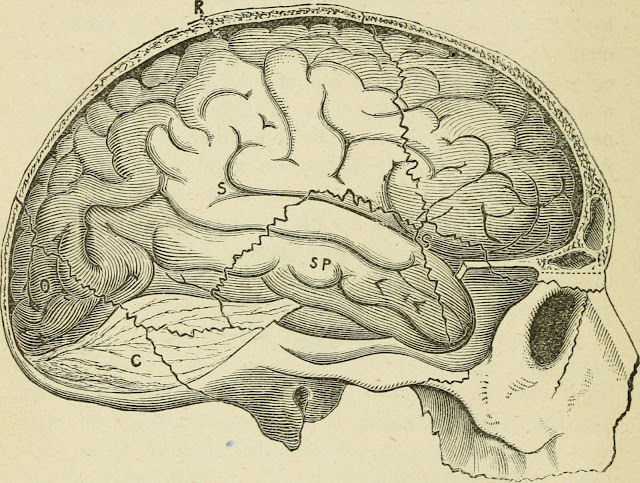 Propositional knowledge establishes some connection between the contents of your mind and the objective world. If the propositions you believe are true, there is some content in your head that accurately reflects what is going on outside your head. But the connection is relatively superficial. [When you understand something] the mind will mirror the world more profoundly than before because the mind will now “take on” the nomological structure of the world, in the sense that the grasped structure will inform the mind in a way that it failed to do before, when one merely assented to the proposition. The claim here is that this ‘deep mirroring’ is intrinsically valuable, i.e. valuable irrespective of any consequences it has for your life. That said, having an accurate mental model of the world will also, presumably, bring many practical, instrumental advantages. It will enable superior prediction and control of the world around you, which may often facilitate greater desire satisfaction and goal achievement. But the content of the understanding matters greatly to this. You could have deep understanding of relatively trivial phenomena. I might understand why my sister stole my action figure on the 8th of May 1994 (in the sense that I understand what her motivations were, what she did and what led her to do it), but this understanding is not that important in the grand scheme of things. It might be far more valuable to know something about Newton’s laws of motion than to understand the motivations of my siblings many years ago. So, really, the superior value of understanding relative to knowledge can only be confidently claimed when we are comparing like with like. Understanding some particular phenomenon is more valuable than having propositional knowledge of the same phenomenon, but when the phenomena are different, this may not be the case. There’s one final theory of the value of understanding discussed in Grimm’s article. It is the theory defended by Duncan Pritchard. 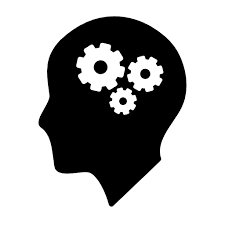 According to this theory, understanding is valuable because it is a type of cognitive achievement. This is appealing since it is already widely accepted that achievements are valuable. Earlier this year, I looked at Gwen Bradford’s work on the value of achievements. She argues that achievements are intrinsically valuable (and, of course, often instrumentally valuable). They involve process-product relations: you achieve something if you follow a particular process and thereby produce an outcome. The process you follow must have two characteristics in order for it to count as an achievement: (i) it must involve some degree of difficulty; and (ii) it must competently cause the outcome. For example, it is an achievement to run a marathon because it is very difficult to do so, and you cannot fluke it or fake it. Contrariwise, it is not an achievement to win the lottery, even though it may be difficult to do so (in the sense that winning is highly improbable), because it does not require any competence: winning is a sheer matter of luck. Pritchard’s theory is that to understand something — to truly ‘grasp’ or ‘see’ the structural relations in a given phenomenon — requires overcoming some cognitive impediment and demonstrating cognitive competency. As such, understanding is a species of achievement. Pritchard puts a lot of weight on the fact that you ‘own’ your understanding, i.e. that your success in overcoming the cognitive impediment is directly attributable to your cognitive skill and ability. Grimm criticises this. He argues that sometimes your successful grasping of some phenomenon is attributable to someone else’s hard work. For example, I understand Pythagoras’s theorem: I understand why it is true that the square on the hypotenuse of a right angled triangle is equal to the sum of the square on the other two sides. But this does not seem to be attributable to my own cognitive ability. It is attributable to the fact that other clever people have come up with easy-to-follow proofs of the theorem. They did the hard work, not me. Grimm thinks it is possible to modify Pritchard’s theory to take this into account. So, while it may be true that someone else deserves the primary credit for coming up with the proof or explanation that enables you to understand, it is still true to say that the subjective grasping of that explanation — the ability to see why it works — is all yours. Nobody else can own that subjective process. The worry, however, is that this modification might diminish the sense of achievement involved in understanding something, and make that achievement far too trivial and ubiquitous. Okay, that’s it for this post. 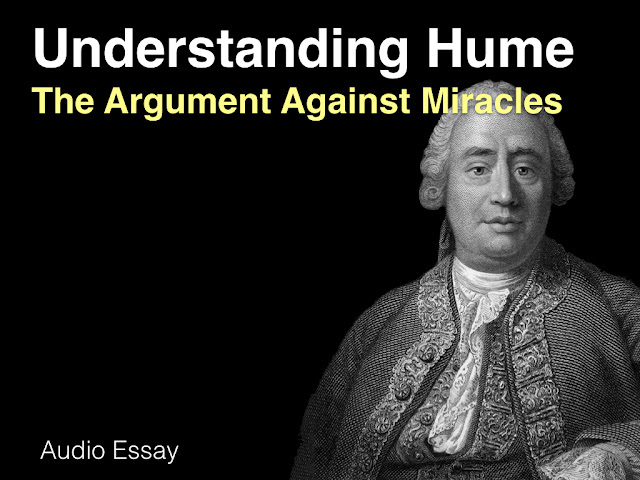 To briefly recap, Grimm’s article looks at three theories of the value of understanding. 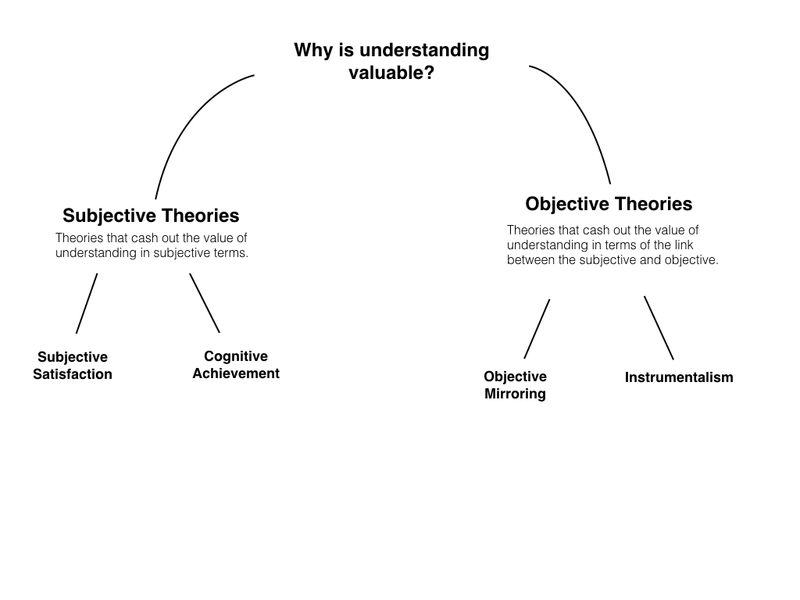 Two of those theories cash out the value in subjective terms: the subjective satisfaction theory and the cognitive achievement theory. The other theory cashes it out in objective terms: the objective mirroring theory. None of the theories suggests that understanding is always and everywhere more valuable than propositional knowledge (since the phenomenon being understood might be relatively trivial), but they do suggest that understanding a given phenomenon is more valuable than simply having propositional knowledge of that same phenomenon.